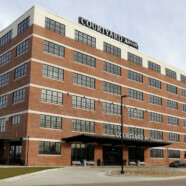 design | Vandewalle & Associates, Inc.
Part of the ARISE downtown renewal plan developed with the help of Vandewalle & Associates, elements of Janesville's new river-centric Town Square and downtown redevelopment are officially open to the public. On September 12 a ribbon cutting took place for the J.P. Cullen Memorial Pavilion, a low, concrete, roofed stage. 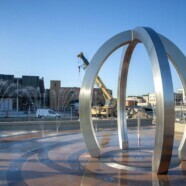 A second ribbon-cutting honored the donors who made the new Interactive Water Feature or "IWF" possible. 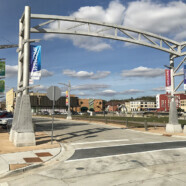 Oct. 26 is the target date for the next ribbon cutting ceremony, celebrating the re-opening of the revamped River Street. MONONA, WI: The Galway Companies construction has been documenting the progress of The Current in Monona. Bordered by Broadway, Bridge Road and the Yahara River, the $40 million phased redevelopment project encompasses about six acres. Things are beginning to take shape! 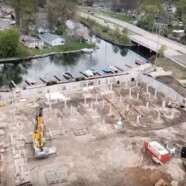 Take a look at the latest video showing footers and foundation elements going in at Monona’s newest redevelopment project.